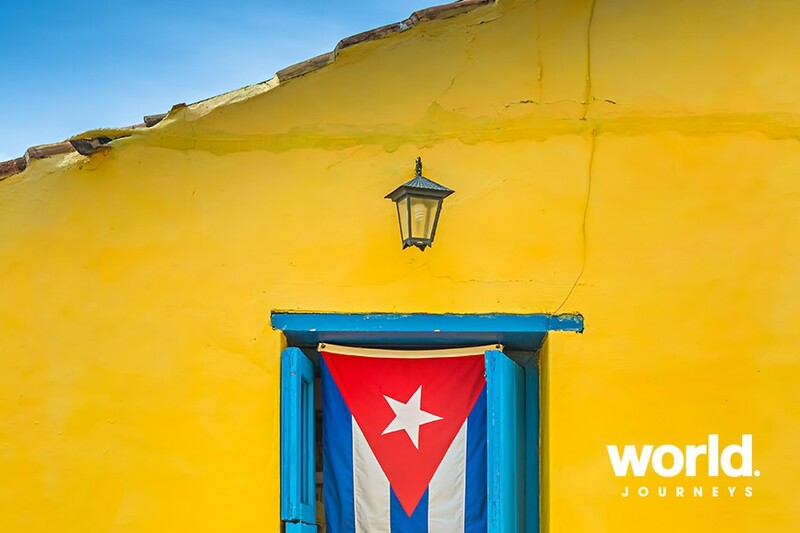 Trapped in a time warp as a result of the Cuban revolution in 1959 and subsequent economic embargo, there is nowhere else like Cuba. 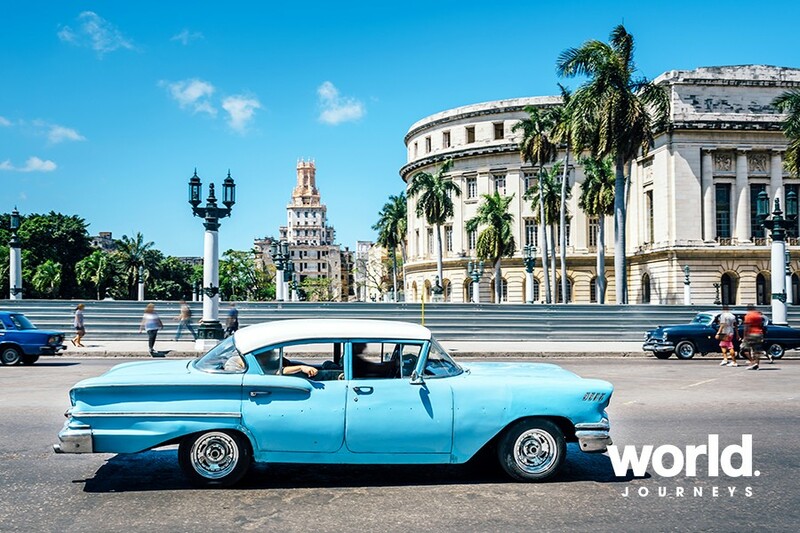 On this journey we visit the great historic cities of Havana and Santiago de Cuba, where 1950s Chevys cruise past in a range of vivid colours; a contrast to the pastel hued architecture of smaller colonial gems such as Trinidad and Camaguey. The stunning natural beauty and fascinating history is only outshone by the Cuban people, incredibly warm and friendly, opening up their homes and their hearts to visitors. Che Guevara and Fidel Castro are still venerated, but times are changing. 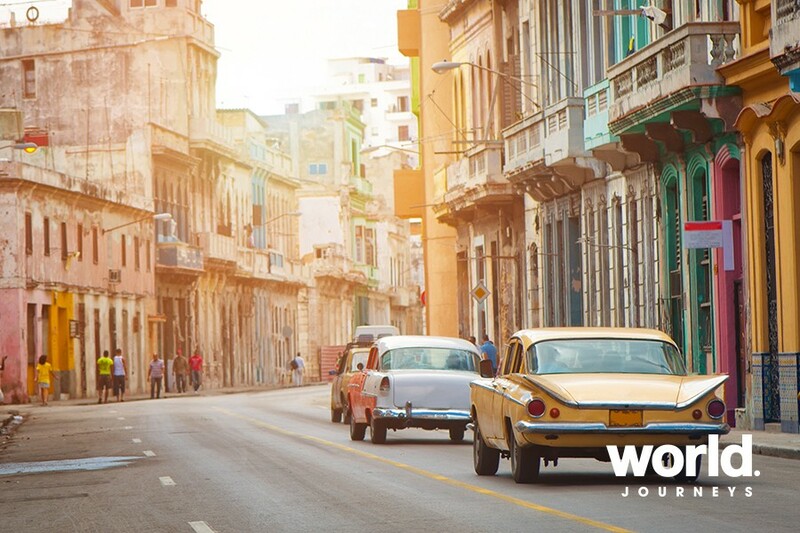 The embargo has been lifted, it's time to visit before the old Cuba is gone forever! Cooking class and salsa lesson Dive into Cuban culture - take part in a hands on cooking class followed by a fun dance class to learn the quintissential Cuban dance, the salsa. Dine at some of our favourite paladares Tucked away in side streets, we will visit some of our favourite paladares, traditional family run restaurants. They serve excellent seafood and delicious traditional Cuban/ Spanish dishes. Be swept up in the rhythm of Cuba Music pervades the island of Cuba! Jazz is very popular and live music often seeps out of town squares. Enjoy some wonderful evenings listening to Cuban music made famous by the renowned Buena Vista Social Club. The Hotel Nacional de Cuba is considered a symbol of history, culture and Cuban identity. It opened in 1930 and has since attracted guests including Errol Flynn, Frank Sinatra, Marlene Dietrich and Winston Churchill. It was also Che Guevara and Fidel Castro's headquarters for the defence of Havana during the Cuban Missile Crisis. Superbly set in the centre of Havana, it offers spectacular views of the harbour, the seawall and the city. This charming hotel offers a wonderful introduction to Havana. On Castro's Cuba you may share with another traveller of the same gender and only pay the 'share twin' price. You must book and pay your deposit at least six months before the tour departure to qualify. Fri 10: Auckland > Santiago > Lima We fly to Lima, Peru via Santiago, Chile. Sat 11: Lima (B) Enjoy a full day sightseeing tour of historic Lima. Sun 12: Lima > Havana (B,D) We transfer to the airport and then fly to Havana. On arrival we will be transferred to the iconic Hotel Nacional de Cuba. This evening enjoy a welcome dinner and a chance to meet our Cuban guide and discuss the tour ahead. 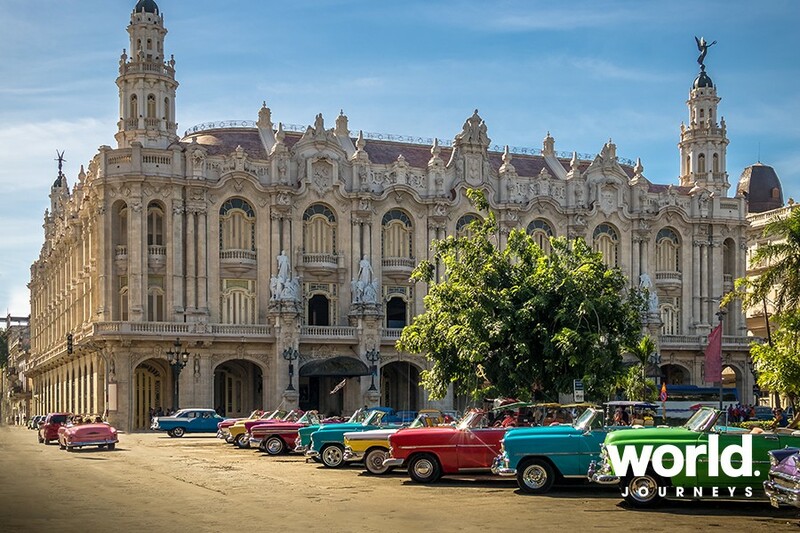 Mon 13: Havana (B,L) Today we explore colourful Havana. 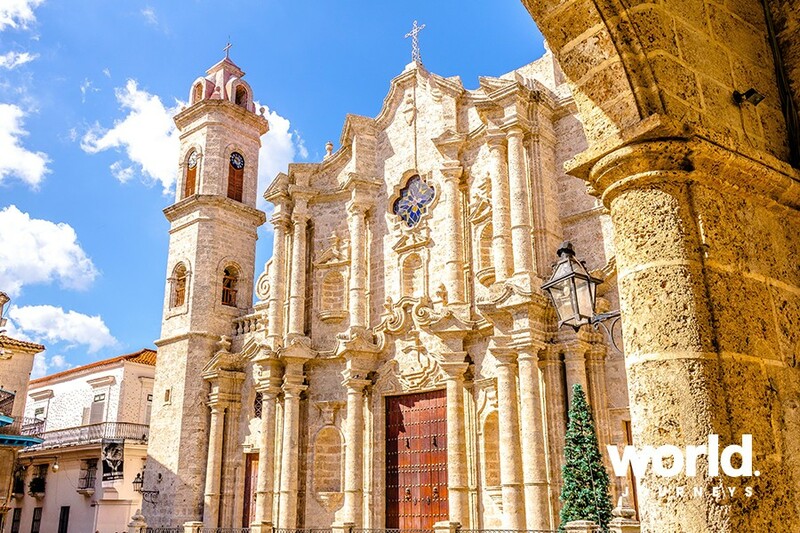 Wander through pastel-coloured boulevards, narrow cobbled streets and flaking Spanish colonial buildings, where faded colours bring charm rather than define age. Highlights include the Cathedral, the Museum of the Revolution, and some beautifully restored parts of the city. Enjoy a delicious lunch in a paladar (family-run restaurant) before being whisked away in a classic (pre- 1959) American car. 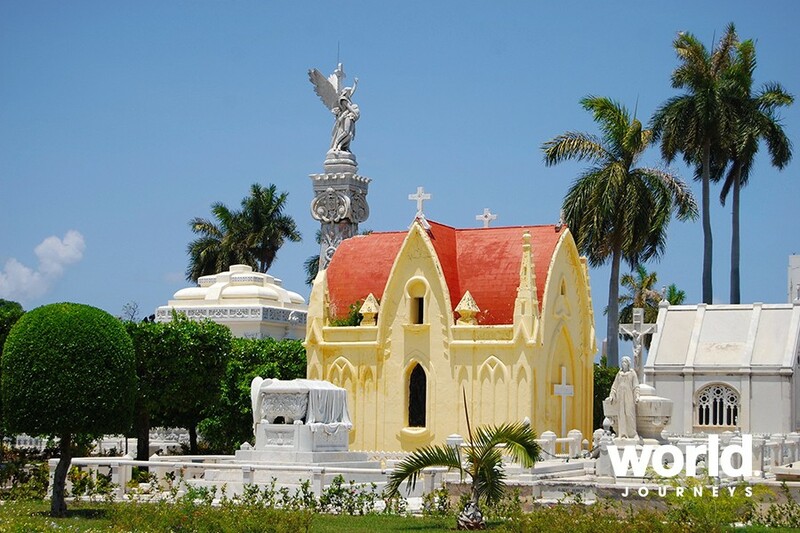 We'll drive along the 8km Malecon, a broad esplanade beside the Caribbean and a wonderful place to see the locals relaxing and playing music. The tour ends back at the Hotel Nacional. Tue 14: Havana > Bay of Pigs > Cienfuegos (B) Today, we drive to Cienfuegos via the Bay of Pigs (Bahia de Cochinos), the scene of the botched 1961 American invasion. In Cienfuegos, enjoy the seaside vibe with a walking tour through spruced-up colonial streets, past the Palacio del Valle, an architectural jewel with influences of Gothic, Romanesque, Baroque and Mudejar architecture - like something out of Arabian Nights. This evening is at leisure with your host on hand to offer suggestions. Wed 15: Cienfuegos > Santa Clara > Trinidad (B) We drive to Santa Clara, where history was made over 50 years ago. It was here that Ernesto 'Che' Guevara and a band of soldiers derailed a train carrying 350 heavily armed government troops. Using a borrowed bulldozer and some homemade Molotov cocktails, this action sealed the fate of the Batista dictatorship. We'll see the statue of Che guarding a museum and the mausoleum beneath it. On to UNESCO listed Trinidad, a perfectly preserved Spanish colonial settlement. Enjoy a walking tour along the cobbled streets of the town and then visit the famous Casa de la Musica, popular with the locals for its live salsa band and delicious mojitos sipped under the Caribbean night sky. Thu 16: Trinidad (B,D) Today we learn how to make Cuban specialties in a cooking class, followed by a salsa lesson. Afterwards, we visit an old sugar plantation in the picturesque Valle de los Ingenios about 10km outside Trinidad. The day ends with a barbecue dinner at the beach, accompanied by live music. 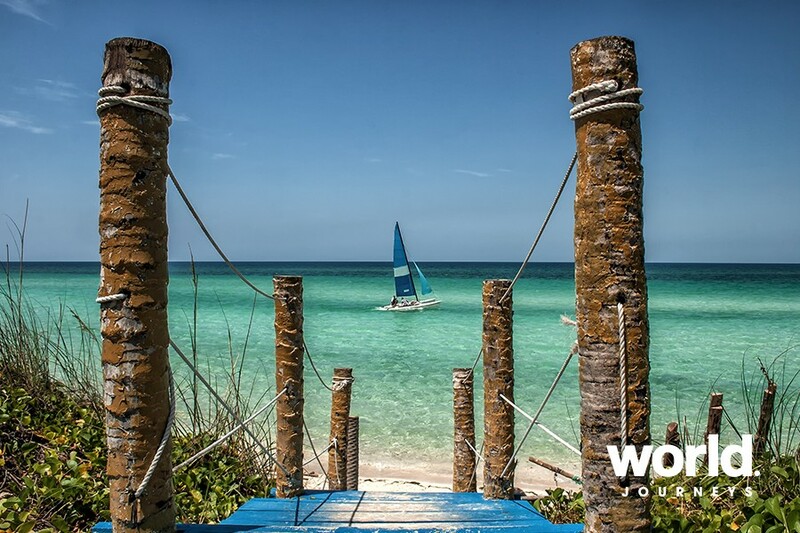 Fri 17: Trinidad > Cayo Coco (B,L,D) Today we head for Cayo Coco, considered one of the finest beach resorts in Cuba. 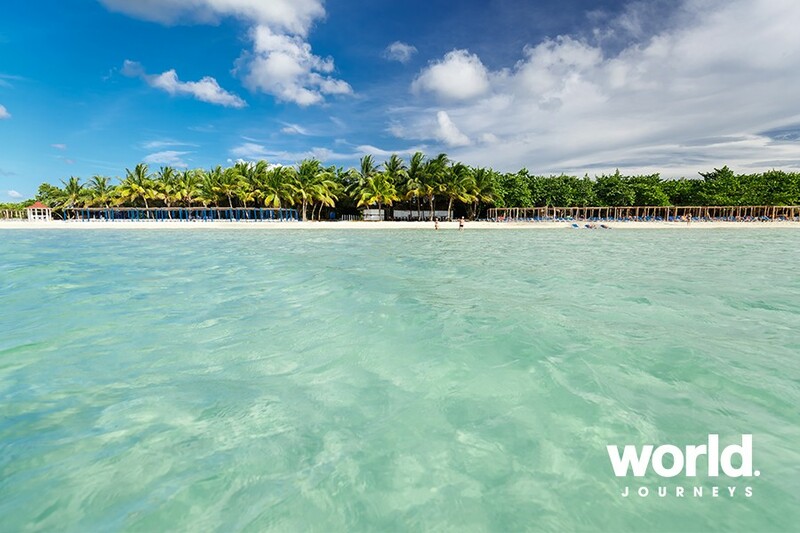 Relax in our beachside hotel and enjoy the warm Caribbean waters. Sat 18 & Sun 19: Cayo Coco (B,L,D) Two days to soak up the sun and enjoy the facilities of this superb resort on a beautiful beach. Mon 20: Cayo Coco > Camaguey (B) A relaxing start to the day before continuing west, experiencing scenes of rural Cuba as we head to the charming town of Camaguey. Tue 21: Camaguey > Santiago de Cuba. (B) Enjoy a bicycle taxi tour through the labyrinthian centre of Camaguey, a UNESCO Historic Site. The town was built that way to confuse pirates. 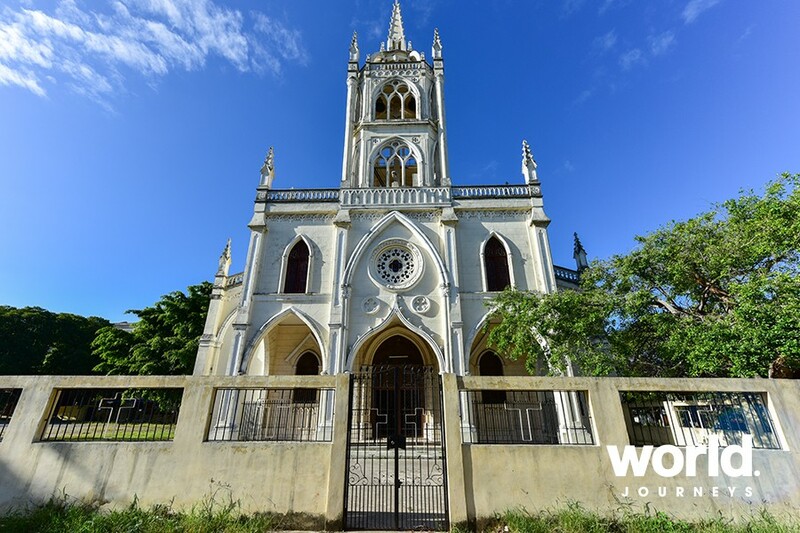 Also famous for its gorgeous architecture and Cuban-baroque churches, Camaguey is a delight. 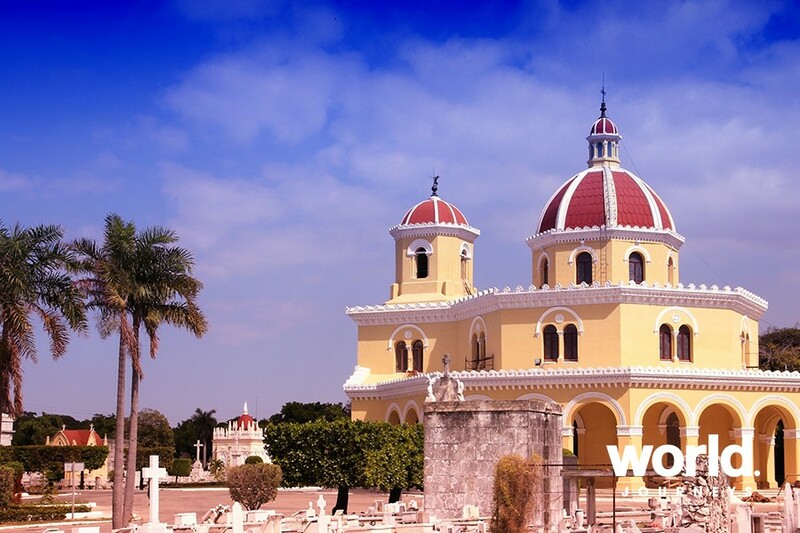 After touring the town, we'll head to the epicentre of Afro-Cuban culture, the city of Santiago de Cuba. Wed 22: Santiago de Cuba. (B) Explore this fascinating city with our guide. 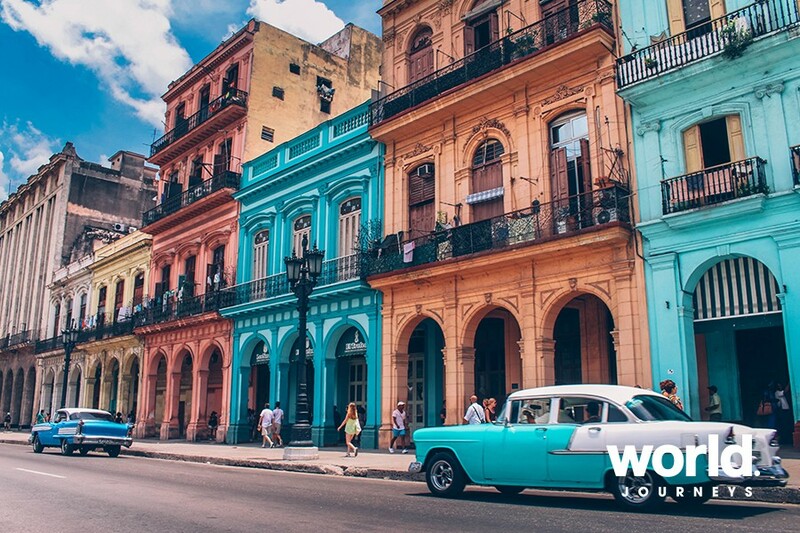 Diego Velazquez de Cuellar made Santiago his second capital, Fidel Castro used it to launch his nationalist Revolution, Don Facundo Bacardi based his first-ever rum factory here, and just about every Cuban music genre first emanated from somewhere in these dusty and rhythmic streets. Included is a visit to Castillo de San Pedro de la Roca, the UNESCO listed fortress built to defend Santiago from an attack by pirates. Those interested may enjoy an optional guided evening excursion to visit some of the city's famous music venues. 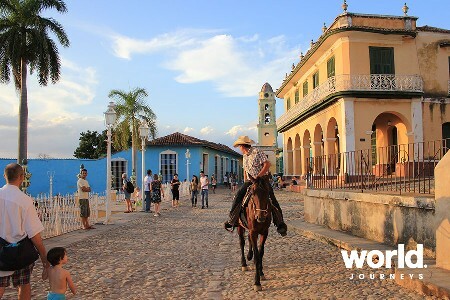 Thu 23: Santiago de Cuba > Havana (B) Fly to Havana and transfer to your hotel. Fri 24: Havana & Vinales (B,L) Today we visit the beautiful Pinar del Rio province, a UNESCO Heritage Site where we will see traditional plantations of tobacco, taro, and bananas. We will visit a tobacco farm to learn about the entire production process, and tour an organic farming operation. Then visit the charming agricultural town of Vinales and enjoy lunch before returning to Havana late afternoon. Sat 25: Havana (B,D) Tour the colourful art district of Havana, Callejon de Hammel. Afternoon at leisure before a farewell dinner. Sun 26: Havana > Lima (B) Transfer to the airport and fly to Lima. Overnight at the airport hotel. Mon 27: Lima > Auckland (B) Depart Lima and transit Santiago. • A non-refundable deposit of $1,500 per person is required, with the balance due 11 February 2019. • As cancellation fees apply, travel insurance is mandatory. *There is an option to meet the group in Havana for the Cuba section of the tour (12 to 26 May). International airfares are not included in this price.